We just had an equinox full moon. Did you see it? I watched the luminous orange moon rise through the bare branches of the trees and climb with maternal majesty into the night sky. The full moon, it seems to me, embodies something both earthly and otherworldly, both at the same time. When the world around us takes on a luminosity and reveals new realities interwoven within the neighborhood we walk daily, that’s a good time to encounter ourselves for the first time…. The blissful state reveals itself as a shining light, as a luminescence permeating the still field of the mind. There is a sense of light from an undefined ‘above,’ silence, a fullness of vitality, and deep rest. 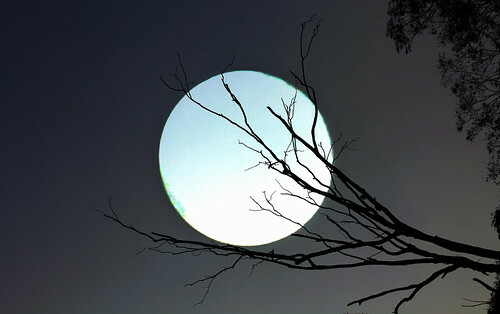 In sacred poetry, particularly in Zen poetry, this is often expressed as the full moon in the night sky. The moon is the individual consciousness that shines only by reflecting the constant light of the sun, which is unbounded awareness. Individual consciousness, like the moon, waxes and wanes, sometimes bright and clear, sometimes dark. When the moon, consciousness, is full, it is round, whole, complete, perfectly reflecting the light of divine awareness. The full moon is enlightenment. It is Buddha-mind. It is the soft light that illumines the land below when all is at rest. With this understanding, reread Shikibu’s poem. Do you feel the power of the statement beneath its beautiful words? When we stand silently bathed by the light of the moonlight, we finally experience our true nature. We know ourselves “completely” — all of the seemingly disjointed and conflicting parts of ourselves are seen to be parts of a unified whole, “no part left out.” We are the wholeness. Izumi Shikibu is one of the towering figures of Japanese literature. She lived in Kyoto and was an official companion to the empress. She married young, but scandalized the court by abandoning her husband to become the lover of one of the empress’s sons. When the prince died a few years later, she took a series of other lovers before eventually marrying for a second time. She was a social rebel, but willing to be fully engaged in her life. And, like her personal life, Shikibu’s poetry mixes elements of eros with the deep awareness that comes from Buddhist meditative practice.